Nearly 30 people, all dressed in black, paraded silently down memory mall. They got looks – some people whispered and took pictures of the soundless procession. One female student held her raised fist up and nodded in solidarity with those who walked. 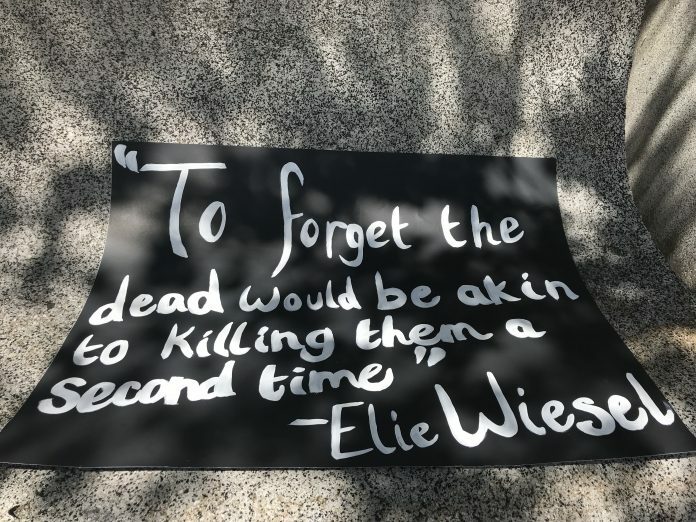 On the backs of the students, were white stickers proclaiming, “Never Forget,” a phrase that became unanimous with holocaust memorial by Elie Wiesel, a holocaust survivor. These students were marching In observance of Yom Ha’Shoah, or Holocaust Remembrance Day. The Nu Delta chapter of Alpha Epsilon Pi organized ‘We Walk To Remember’ on Thursday at the University of Central Florida. AEPi chapters across the nation partnered with B’nai B’rith International, a Jewish service organization, to stage similar marches throughout college campuses. Attendees held signs emblazoned with the Star of David, as well as slogans such as “We Remember” and another quote from Wiesel, “To forget the dead would be akin to killing them a second time.” Others wore Israeli flags draped over their shoulders, and a gay pride flag with a Star of David was held at the front of the procession. Those participating were given small flyers to hand out, explaining the reasoning behind their silent walk. It highlighted the atrocities of the holocaust, not only to Jews but also to the millions of others who perished. Participants walked silently from the John C. Hitt Library to the CFE Federal Credit Union Arena, where a small service was held. During the service, speakers encouraged attendees to never forget those who were lost, and 11 candles were lit in remembrance of the lives lost during the holocaust. Speakers included Rabbi Ethan Paris, Dr. Kenneth Hanson, the program director for Judaic studies at UCF and Andrew Weil, the executive director and CEO of Hillel Central Florida. Paris led the crowd in a recitation of Kaddish, a Jewish prayer typically recited for the dead.